GlaxoSmithKline's transition period has been far rougher than expected, causing shares to drop nearly 15% last quarter. Even so, there are three compelling reasons to believe that shares could rally heading into the end of the year. Like most big pharmas these days, the U.K.'s GlaxoSmithKline (NYSE:GSK) is going through a transitory period as key medicines like Advair and Lovaza lose market share to new products. Compounding these problems, Glaxo is facing bribery allegations that have now spread to several countries in key emerging markets. And as a result of the consistent bad news, Glaxo's stock has thus slumped nearly 15% in the past quarter. Despite these major headwinds facing the company, I believe there are three compelling reasons why Glaxo's stock could rebound. But before getting into the reasons, it's important to remember that there are no guarantees that a stock will rise or fall -- any number of outside factors (market crash, other unforeseen bad news for GlaxoSmithKline, etc.) could intervene. With that in mind, let's get started. The recent price drop could generate interest in a buyout or merger with a U.S.-based pharma seeking a coveted tax inversion. Pfizer reportedly offered up to $118 billion for AstraZeneca earlier this year, mainly for the tax benefits. And given that Glaxo's market cap has recently fallen to a hair under $114 billion, it could now be a viable alternative for Pfizer, especially if its pursuit of AstraZeneca ultimately fails. Although Glaxo's CEO Sir Andrew Witty has downplayed any possible megamergers in the near term, there are intriguing synergies between Glaxo and Pfizer's product portfolios that could make such a deal worth pursuing by both companies. Glaxo's respiratory medicines have been at the core of its commercial problems, but there is hope moving forward. Although the company was expecting sales of newer products like Anoro, Breo, and Incruse would offset declining Advair sales, this strategy hasn't panned out largely because opinion leaders like Express Scripts Holding Company have excluded Breo from their list of medicines eligible for reimbursement. Medicare Part D coverage for Anoro and Breo has nonetheless started to increase in recent quarters, slowly building market access for these new drugs. Moreover, Glaxo is expected to gain additional regulatory approvals for these medicines, as well as other experimental products, in the near future. Glaxo is thus projected to return to growth by 2015, giving the company an attractive forward price-to-earnings ratio of roughly 13 at current levels. 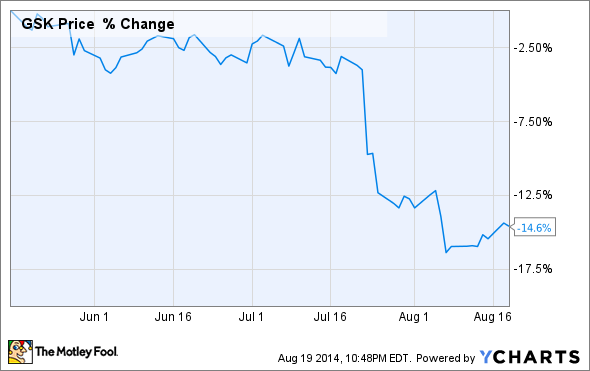 Put simply, Glaxo shares look cheap following this double-digit drop in price. Perhaps one of the best reasons why investors might find Glaxo shares compelling at current levels is its handsome dividend yield of over 5%. Even though management decided to cut back on share repurchases for the time being, they are continuing the trend of increasing annual dividend payments at a nice clip. Compared to the second quarter a year ago, for example, Glaxo's dividend has increased by a noteworthy 6%. As such, Glaxo presently sports one of the highest yields among healthcare stocks. The convergence of bad news emanating from Glaxo lately has certainly taken its toll of share price. Even so, this dip has created an attractive entry point for investors with a long-term outlook, in my opinion. While the buyout/merger hypothesis may turn out to be little more than informed speculation so to speak, Glaxo is on track to generate top-line growth next year and its track record of increasing dividend payments will undoubtedly garner attention from income investors. So while this transitory period has been a rough time for the company and its investors alike, I think there are fundamentally sound reasons to be optimistic going forward.